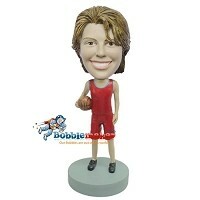 If you’ve been looking for a customizable female bobblehead doll to give as a gift to a special woman in your life, then look no further. 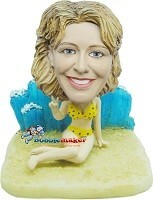 We have one of the largest collections of woman bobbleheads on the Internet. These female bobble head dolls come in many shapes and sizes, and they’re all doing something different. So whether you’re looking for a professional businesswoman bobblehead, or a bobble head doll that’s chilling on the beach, we’re sure to have it for you! After you’ve selected the pose and clothing for your custom female bobble head doll, the real fun begins. By sending us in a picture of the person who’s image you’d like the bobblehead to be made in, we’ll customize your creation to look like that person. That’s why these custom female bobbleheads make great one-of-a-kind gifts for any occasion, including birthdays, Christmas, Mother’s Day, and many more!